Happy birthday Prince! The Purple One turns 52. I think my favorite Prince song remains "I Could Never Take the Place of Your Man," with "Starfish and Coffee" and "Take Me With You" right up there too. 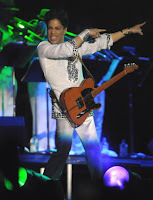 Happy Birthday Prince, you mega-talented hot little thing!